Most pest control discussions tend to focus on insectoid pests. In our mountain-top farm, we worry about gophers, raccoons and, of course, birds. Apple Maggot Control Bags [blog,buy] from Raintree Nursery. Someday I will have to write an entry detailing my love of this particular nursery, but not today. Suffice to say that they are located close to my mother's place and we came upon them accidentally this winter while traveling in Oregon. While perusing the shop in an unabashed fangirl and fanboy frenzy, Rob and I came across a bag of what appeared to be those nylons you can wear on your feet while trying on a pair of shoes at the store. Hmm! What they actually turned out to be were wonderful barriers to prevent infestations and, we hoped, to fool the birds and raccoons into ignoring tasty, ripening fruit. Due to a late-season hail storm after an unseasonably warm and dry winter we only had two, TWO, cherries on our Montmorency. Because this one is right outside our back door and we could observe it easily, we dutifully covered both cherries (*sob*) in a control bag. To our delight, both cherries ripened beautifully without molestation by the birds. They were quite tasty, too! The aforementioned dastardly storm did a number on all of the stone fruit closest to the house so we only had one peach on the tree, its first year of production. The peach's skin was beginning to blush red and then it disappeared! Before I delve into our experiment again, I just want to wax a little bit lyrical about this apricot cultivar. It is the only apricot I will eat, primarily because it is strongly reminiscent of the Santa Rosa plum in flavor. The highest praise I can offer any fruit, Santa Rosa plums are the flavor of my best childhood memories. In 2007, the Moorpark suffered a vicious attack from raccoons after producing heavily in celebration, no doubt, of its seventh year. Branches were broken, destroying 75% of the tree. It stopped flowering for many years, only resuming two years ago with fewer than a dozen fruits each season. The raison d'être for summer! It finally set more than a few fruit, about two dozen, in its third year with us. Obsessively Reverently, each plum was wrapped in nylon. Go ahead and insert a cry of existential pain right here. We only found one of the covers. So, between now and next spring, we will be thinking about better raccoon-proofing! The photograph of the Leopard lilies (Lilium pardalinum; Jepson, Wikipedia) in the banner for this series was taken during our first Pocket Botany outing. It was a hot, lazy July day just after the Fourth of July and we had driven within 30 minutes of my MIL's excellent dinner. It wouldn't do to be late! Around the 3000' mark, we began to feel that the surrounding landscape had a tale to tell us so we pulled off the freeway and onto a side street. 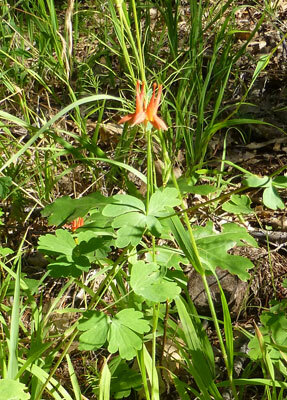 The first thing we saw were the Leopard lilies. They captured the attention of all of us and confirmed that we had come to the right place. In Southern California, our friends have some land near a prolific stand of enormous Humboldt lilies (Lilium humboldtii; Wikipedia) and this was my initial, erroneous, identification. Rob says that the Leopard and Humboldt lilies grow in regions which exclude the other species. Besides being much smaller than their cousins to the south, the Leopards grow in what turned out to be a very wet area. See these amazing algae growing in the rivulet alongside the lilies. Nearby we also found some living fossils! Horsetails first appeared during the Carboniferous period but during this Holocene excursion we were treated to two different species. 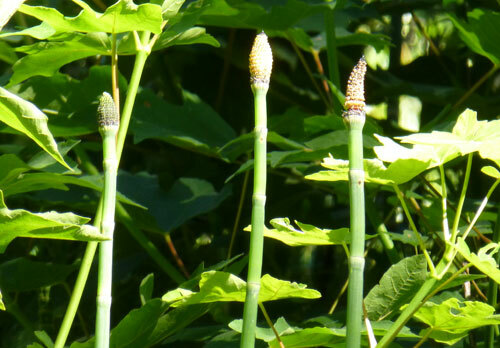 Below is a nice picture of the Equisetum hyemale L. subsp. affini (Engelm.) (Jepson) we found. We have yet to identify the second species. These horsetails were growing in the rivulet and up a slumping bank covered in thorny blackberry brambles. 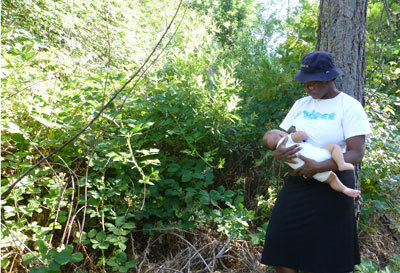 Naturally, while Rob was taking the picture above, baby BD decided that this was a perfect time and place for a nursing break! You can bet that we will return to this site in a few weeks for some prime blackberry picking and jam making afterwards at grandma and grandpa's house. Although we saw a great many excellent plants, including a terrestrial orchid, monkeyflowers and wild carnations, another highlight of our 30 minute pocket botany exploration was running into an old friend I haven't seen for years. We call her The Beautiful One, after the Latin, but her more widely known common name is the Crimson Columbine (Aquilegia formosa; Wikipedia). When my husband and I first met at Caltech in the earliest 90s we shared a wide-ranging love of nature. Class field trips, impromptu hikes and our own research led us far afield, exploring California's geology, fauna and flora. As I've mentioned before, my husband Rob is a botanist. Self-taught, he is an expert in California flora as well as the bulbs and Mediterranean floristic zones of South Africa and Australia. Under his tutelage, I became conversant enough in Californian and desert botany (Mojave and Sonoran) to work as a botanical field assistant. Fast forwarding a few decades, Rob and I married and while raising my two older children, decided to have one of our own. Our sweet little guy entered our lives in April of this year. 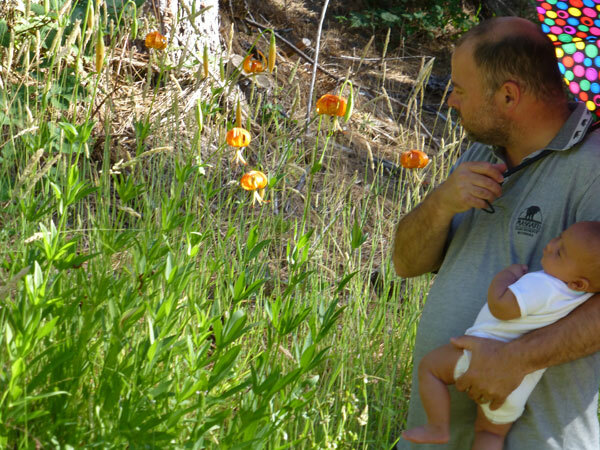 The Pocket Botany series unveils the small pockets of time when we take our little naturalist out and about to discover the natural world, usually meaning its plants and mycorrhizals. We hope you enjoy and are inspired by our stories.